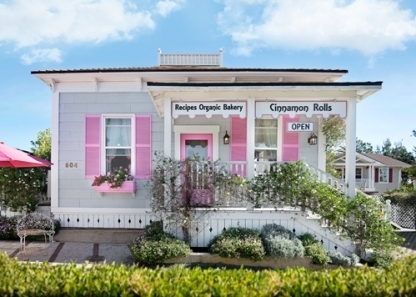 After experiencing quaint coffee houses and specialty drinks—like Long Blacks, Flat Whites, and Babycinos—in Australia, Meichelle Arntz decided to renovate a 100-year old home in downtown Santa Barbara and open her own little bakery, complete with natural, fresh baked fare made from recipes passed down from her family. She’s owned and operated a successful gift basket business for 15 years, and continues to offer artful baskets filled with cookies, brownies, cinnamon rolls, caramel corn, and other fresh baked goods, all placed in decorative jars, pottery, and other unique items. Meichelle grew up baking and loved being in the kitchen. The reason the bakery is called Recipes Bakery is because the delicious recipes used to make our treats come from grandma, mom and the aunts. “Recipes” was the idea of Meichelle’s daughter Toree, who came up with the name during a family discussion 15 years ago about what to call the gift basket business.